"I'd like some flowers for my wife, please." "Certainly, Sir. ", replied the florist. "What did you have in mind?" 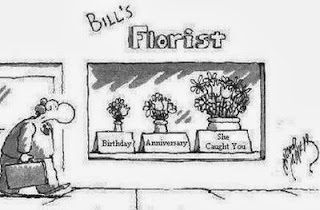 The man hesitated, "Well, I'm not sure, I uh, I uh, I uh..."
"Perhaps I could help," said the florist. "What exactly have you done?"